The Museum relies on its friends and supporters from around the world, who share information and visual material with us. In addition to animal lovers, sailors, artists and history buffs, we are also fortunate to have the expertise of curators, underwater archaeologists, mariners, historians and archivists. We welcome your leads and suggestions about maritime pets! Please share our Facebook and Twitter links with friends. Tweets often transmit historic photos uncovered by researchers and nautical history buffs from around the world. Sailors and their pets also share stories and images. Recent correspondents include Salty Cat, who cruises around the world, and Pierat, who cruises the Pacific. These pets (with their humans' assistance) blog about their seafaring adventures. A former South African Naval officer has shared many photographs, articles and personal stories about the mascots and working animals used by their Service. 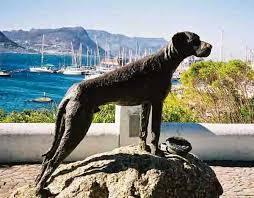 A very famous World War II mascot, Just Nuisance, even has a memorial in Simonstown Harbor, near the Cape of Good Hope.